Sometimes you might want to know how your website ranks in Google and other search engines for a particular keyword. One option is to go through search results manually. But if your website does not ranks in the top few pages, it might be a hassle. Good thing is that there are many free tools available that let you find search position of your website in Google. There are many online search position finder tools also that quickly find search position for you. 1. Google Position Checker Tool: Google Position Checker tool is one of the easiest to use search engine position finder tool. You just need to provide your website URL, and keywords for which you want to find SERP. Google Position checker tool will immediately return the search engine position for your keywords. It also lets you choose country for which you want to check search position in Google. One drawback of this tool is that it searches your website position in top 300 search results only. So, if your website is not in top 300 search results, this tool will not show its search position. Try it here. 2. Search Google Position: Search Google Position is another free tool to check SERP. This free search position finder lets you find your website results in top 1000 results, unless the previous tool that finds just top 300 results. However, this SERP checker lets you check just 3 keyword searches daily. If that’s all what you need, then this tool is pretty good. Try free here. 3. iNeedHits SERP Checker: This is a free search engine position checker tool to find search position of your keywords in Google. However, you need to first create a free account to use this tool. Once you have done that, you can just provide your keyword, and this free search position finder will tell you search position for your keywords. One major advantage with this tool is that it will find search position of your keywords in Google, Yahoo, and Bing all at once. However, one problem with this tool is that it does not gives exact position if the position of your keyword is more than 100. In that case, it just shows “100+”. Try free here. 4. Search Position Finder: This is another easy to use Google search position finder tool. You just need to provide keyword and your website URL. This tool also lets you find search position in Yahoo, MSN, and Ask. The drawback with this tool is that it searches just first 100 search results. Try free here. 5. 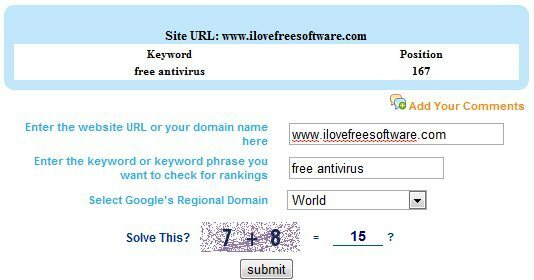 Google SERP Rank Checker: This free online SERP rank checker tool lets you search your website position in first 64 positions only. Try free here.